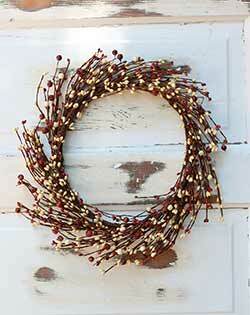 Fall Wreaths & Candle Rings - perfect for decorating your front door, above a mantel, or as a centerpiece! Fall leaves, pip berries, pumpkins and more add warmth and texture to your home all season long! Be sure to also shop our huge selection of Halloween Decor here! 3.5 inch Autumn Pip Berry Candle Ring - Add a jar or pillar candles and decorative plate or bowl to complete an easy centerpiece for your table! 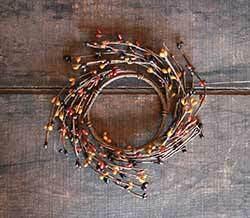 Make an instant decorative accent for fall with this candle ring, featuring colorful faux bittersweet! 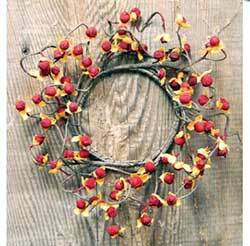 Features flexible twig branches accented with orange fabric leaves and red, round foam berries. 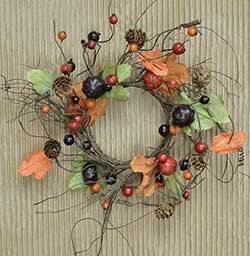 Make an instant decorative accent for fall with this small wreath, featuring colorful faux bittersweet! Make an instant fall center piece with this floral candle ring, featuring mini resin pips, plus tiny pumpkins and candy corn. 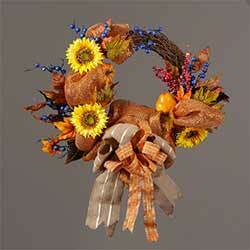 Make statement for fall or halloween with this rustic wreath, featuring mini pumpkins and candy corn. 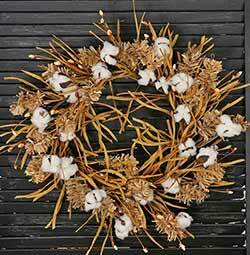 Features a mix of dried grass, straw, foam buds, and cotton clusters in their natural shells. 22 inches. Make an instant centerpiece with this fall candle ring, featuring wispy twigs, accented with tiny pinecones, and faux leaves and pumpkins. 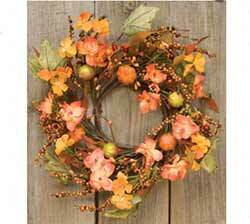 Great as a candle ring for a centerpiece, or to decorate a small wall space, this colorful floral wreath features fall flowers mixed with mini pumpkins, leaves and berries. 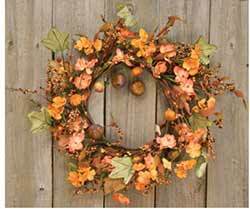 Decorate a front door or wall space with this colorful floral wreath, featuring fall flowers mixed with mini pumpkins, leaves and berries. 14 inch. 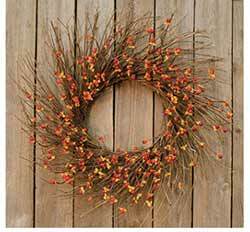 Add country color and texture to your wall, door, or table with this pretty fall wreath, with berries in rust, burnt orange, and ivory! Make an instant fall or halloween centerpiece with this floral candle ring, featuring mini orange pumpkins. This primitive candle ring features resin berries and pips in beautiful burgundy, cream, olive green, and deep dark navy/plum/black on a realistic looking twig base. 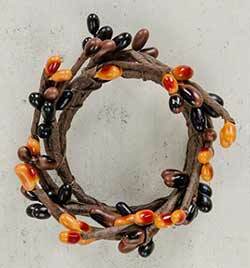 This Primitive Candy Corn Ring features assorted sized berries in honey, rusty and black come together with faux leaves and resin candy corn. Great to use at the base of pillar candles. This Primitive Candy Corn Candle Ring features assorted sized berries in honey, rusty and black come together with faux leaves and resin candy corn. Great to use at the base of votive candles, or as a napkin ring! 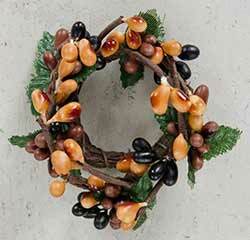 Features resin pips in a mix primitive colors, with fabric leaves on a brown-wrapped floral ring. Great for everday decor, but also a nice choice for fall! Features resin pips in a primitive mix of browns and black on a brown-wrapped floral ring. Mini size is great for a tealight candle! Make an instant fall centerpiece with this floral candle ring, featuring mini orange pumpkins, resin pip berries, pine cones, and autumn leaves. 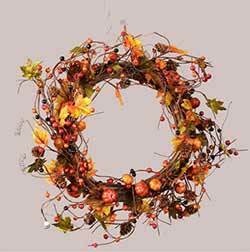 Make statement for fall with this pretty wreath, featuring mini orange pumpkins, resin pip berries, pine cones, and autumn leaves on a twig base. Great for a wall space, above a mantel, or on a door! 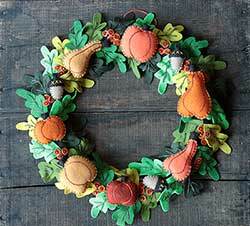 Pumpkin & Gourd Wreath - Made of wool felt, with appliqued leaves, gourds, acorns, and pumpkins. 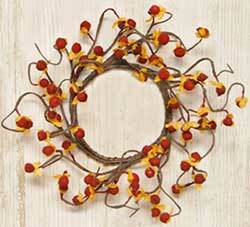 Features orange pip berries on a wispy, brown-wrapped floral ring. Great for a pillar candle! 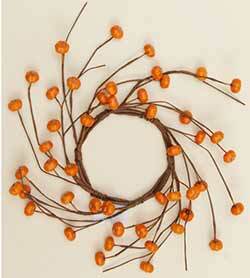 Make an instant decorative accent for fall with this candle ring, featuring orange faux berries and pumpkin pods! 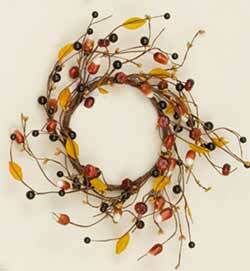 Make an instant decorative accent for fall with this candle ring, featuring orange faux berries and pumpkin pods. Great for a pillar candle! Love the cotton floral look, but bright white just doesn't doesn't go with your decor? 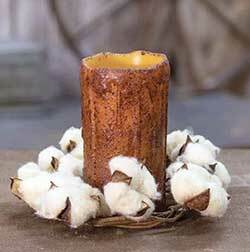 Then this teastain cotton candle ring is for you!